This green rope dog lead with light green comfort handle has a locking carabiner style clip which is easy to attach to the collar or harness. The clip also rotates preventing the lead from twisting. These green rope dog leads are perfect for all working and country dogs as well as those who pull on the lead. The comfort leads are available in two lengths - a 30in and a 44in. The 44in lead has an extra O-ring on the handle, allowing you to close the lead and wear it over your shoulder while your dog is off the lead, or to attach poo bags or other accessories. 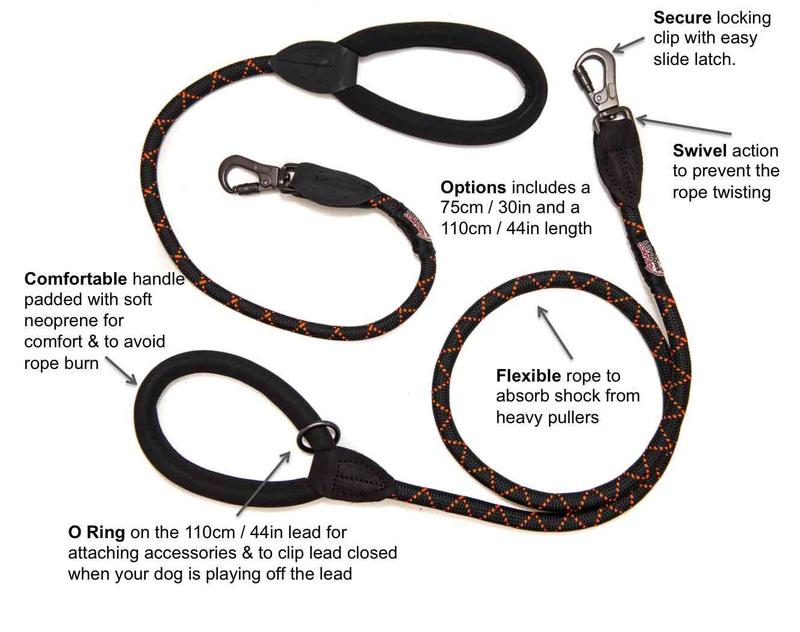 The Comfort Leads are probably the most comfortable leashes on the market. The lead is made using strong polyester rope, with soft padding over the handles, and a locking karabiner-styled safety clip. In addition to making the lead comfortable to grip,the padding helps prevent chafing from heavy pullers. The rope has a little bounce, to reduce shocks, and make walks less of an arm jerker.